Transfers, other than those from Lyon. The southern Burgundy is a treasure of historic churches and chateaux set in rolling countryside carpeted with vines and forests. A number of rocky outcrops punctuate the vineyards such as the celebrated “roche de Solutré” important for its pre-historic human activity. The Burgundy region is well-known for its fine wine and gastronomic food, a reputation that is richly deserved. You will have plenty of opportunity to sample both during your cycle. In addition you will have plenty of time to see the varied and rich architectural delights of the region, such as those found at Cluny, a very important spiritual, political and artistic centre of the Middle Ages with its Benedictine abbey. The town of Tournus is home to some beautiful buildings including one of the largest Romanesque churches in France. 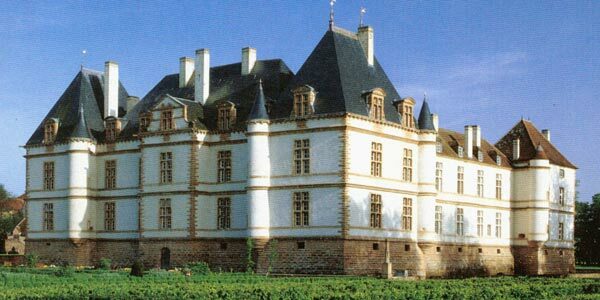 Besides these towns many of the pretty villages you will travel through have splendid chateaux and impressive churches. The cycling on this holiday is gentle and suitable for most people. It uses an off-road cycle path for over half the holiday. 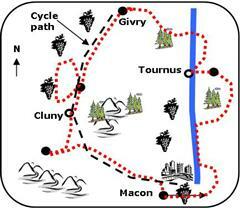 The day's cycling can be up to 55 km (or 32 miles), although the average (not counting the rest day) is 40km. There is a hill of about 140m on the final day. Otherwise the cycling is on gently undulating terrain. 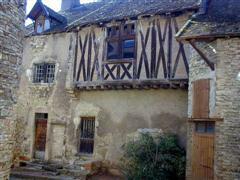 Welcome, drive to St Amour in the Northern Beaujolais and settle in to your first guest house. Day 5 can be used for relaxation and rest, whilst enjoying your surroundings which include the opulent “Chateau de Cormatin” with its impressive “gold room” and vast park. You can, however, explore more widely with the choice from a number of established cycle routes of varying lengths and difficulties that take you into the heart of the Burgundy vineyards. Why not take the time to visit the vineyards and try the local wine. You will be staying in a number of charming hotels and bed & breakfasts full of local character (3 corns quality). All rooms have private bathrooms. The principal guest houses of the holiday are shown below. We cannot guarantee that you will be staying in all of these exact guest houses. A hearty and healthy continental breakfast provides the perfect opportunity to discover the local specialities such as home-made jams and local cheeses. At midday you will eat packed lunches prepared by your hosts. Most evening meals will be taken at your guest houses with your hosts, where you will be treated to local delicacies. Two meals will be taken in a local restaurant where you will have a choice of menus. (These two meals are not included in the price of the holiday). Local specialities will be available to try every evening.